Over the last 12 months, Cindy Allen has earned an impressive $193,900 from a tiny mailing list of just 132 past clients. She does this while working less than 30 hours per week, and she gives herself plenty of vacation time. As impressive and envious as this sounds, how she accomplishes this is what truly stands out. Cindy didn’t always have this level of control over her time and focus. When she got into the business, her hours and income weren’t as idyllic as they are now. Then her normal life of nearly 20 years came to an abrupt halt. At age 40, Cindy had her first child, and she needed to shift all of her attention from her business to caring for him. Her son needed her full time, all day, every day. Cindy found herself in a time paradox. She needed a way to earn a full time income on significantly less than full-time work! Out of this tumultuous time, she learned a very valuable skill: how to implement “set it and forget it” systems. These are the systems that power her current income and give her time to enjoy it! Today, she supports her business and life with a very unique real estate selling process. It’s built around her personally branded blog from Keeping Current Matters, which she credits with helping her buy back lots of time. Her blog educates her clients for her and gives them the confidence to take action. True to her “set it and forget it” mindset, Cindy doesn’t worry about researching, writing, producing, or publishing any of her news articles, buyer and seller guides, or infographics. All of her blog posts are professionally written for her and personalized to her brand by Keeping Current Matters. They’re also published and hosted for her at her own unique URL. This saves her from dealing with anything technical, giving her more time to spend on dollar productive activities (or spend with her family). She set up a link to her blog from her primary website. She shares the newest posts on her social media profiles. She individually emails clients at specific times in the buying or selling process with links to relevant posts that overcome their unique objections. These tactics help Cindy earn more than 3x the average Realtor’s income, while working less than half the time. But the real power in how she maximizes her time and money goes well beyond setting up and sending out a few links. To see specifically what she does and how she does it, here are four real world examples of how Cindy utilizes her Keeping Current Matters Membership materials to reach her goals. Many renters are uninformed about their down payment and credit score options, which stop them from buying. But when a renter has the wherewithal and is simply waiting for the perfect time or home to buy, it’s important that an agent understand how to illustrate why waiting may not be in their client’s best interest. To breakthrough situations like this, Cindy has a proven approach that opens her clients’ eyes to the true cost of waiting. And more often than not, educating them on the facts motivates them to buy instead of rent. When Cindy works with a client who’s thinking of waiting, she ensures they have all the facts they need to make an educated decision. She often emails a link to an article from her blog, one highlighting the difference in a homeowners vs. renters wealth, for example. The email is very simple with just a couple sentences introducing the link to the article. With just 5 minutes of energy and effort, Cindy’s renter-to-buyer conversion process is in action. Then it’s only a matter of time before her phone rings and she can have a conversation with her client about the negative financial impact of renting and the overall benefits of homeownership. “They’re talking about leaving the military and moving here. And they’re talking about renting for a year. I sent them the article about how homeowners are 45 times wealthier than renters. It allowed me to show him what the true cost of renting was with his loss of tax write-offs…if interest rates go up and if property values go up. Cindy earned their business and motivated these renters to buy because her approach clearly and confidently explained their options and the costs of renting for another year. Many real estate agents make a common yet rarely discussed blunder: treating referrals like they’re already clients. Referrals are not clients; they are leads. They’re not committed to any particular agent yet, and they will seek to validate a friend or family member’s recommendation for themselves. Cindy, whose business is nearly 25% referrals, arguably understands better than most the nuances of validating referrals. “If they’re asking friends or have told friends that they’re buying or selling a home, they’ve got other people telling them who to use as well. You’re probably not the only one. And when they go to my website, they’re directed to the blog. And they’re able to see all the details there. Whether they’re buyers or sellers, they are going to go to that section and they read the posts. Cindy understands the psychology of today’s informed online buyers. Her smart approach educates both referrals and clients with simple and effective real estate articles that preemptively handle their objections and motivate them to act now! There are windows of time when clients are more open to the advice of a real estate professional and more likely to reject it. Part of Cindy’s secret to success is rooted in recognizing this and delivering the right message at the right time. Cindy understands when her advice could be misperceived as salesy or self enriching, so she adjusts the message she communicates accordingly. Cindy instead helps her clients educate themselves and strategically times her advice. When her clients are most receptive, she dives into her personalized blog and handpicks relevant articles and infographics to send. “I’ll go in, find a blog post, and paste that into an email. 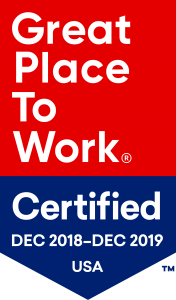 Paste just the link to it into an email, and I’ll have a conversation with them about it and then send them that email. What happens next is pure genius. Clients go to her personally branded blog and consume what she sends. No one ever questions whether she wrote the articles or designed the infographics. They simply give her the credit. Depending on the season, Cindy uses this tactic 3x/week. It’s not hard to hop on the blog and see which articles might be beneficial to which buyers and sellers once you know the repertoire of what Keeping Current Matters produces. The home buying and selling process is stressful enough. The last thing she wants is to trigger adversarial attitudes, when it’s her vs. her clients. Rather, she works to establish an us vs. the issues attitude, and together win as a team. The reason Cindy’s buyer motivation process works is because she helps her clients feel confident, safe, and smart, not sold to. Hesitant clients are often just uninformed clients who need the facts clearly explained to them. Cindy recalls a specific time she used KCM materials to educate a buyer who was on the fence.. But with an education first approach, Cindy showed her client the current research on the cost of waiting to save and the cost of waiting to find a dream home. Her process of getting hesitant buyers to become informed buyers allows her to have the hard conversations around the facts. By showing her clients they’d actually become worse off than if they just went ahead and bit the bullet and bought an affordable home now, she motivated them to call their lender and get pre-qualified. “That was a dynamite piece in being able to show them prices going up, it had pieces about the cost of waiting to buy that lets me show her the loss of purchasing power because of raising prices. 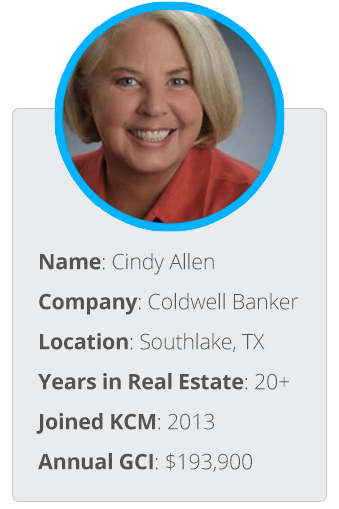 Cindy is a model of modern real estate success. She has clear personal goals and a keen sense of how to implement systems to help her reach those goals. She uses Keeping Current Matters to help her buy back time so she can take off 3-4 months a year, spend it with her son and family, without putting a dent in her income. Cindy believes education is the ultimate sales machine, and while she could do all her own research, writing, editing, designing, and publishing – she chooses to get it all done for her for less than $20 a month. All of her articles and infographics are written for her and automatically updated to her personalized blog five days a week. Plus, she gets access to webinars and other professional development tools she uses to articulate market facts to her clients. Cindy reaches her goals because her processes and systems are effective at educating and motivating her prospects and clients into action. For real estate professionals who also believe educating your prospects and clients is a key differentiator and wish to have all the research and writing done for them, Keeping Current Matters is a tool that’ll help you reach your goals, too!